The PXIe-8820 RT is a modular PC in a PXI Express 3U-size form factor. The following figure is a functional block diagram of the PXIe-8820 RT. Following the diagram is a description of each logic block shown. The processor is an Intel® Celeron® 1020E processor (2M Cache, 2.2 GHz). The processor connects to the SO-DIMM block through the DDR3 interface supporting up to 1333 MHz SO-DIMMs, and to the PCH through a x4 DMI2 (Direct Media Interface) interface supporting up to 5 GT/s per lane and through a x4 FDI (Flexible Display Interface) supporting up to 2.7 GT/s per lane. The SO-DIMM block consists of one 64-bit DDR3 SDRAM socket that can hold up to 8 GB of memory. 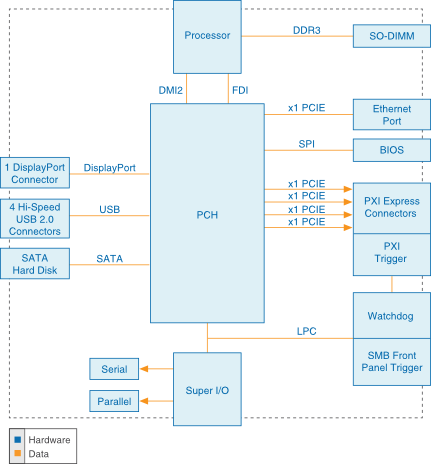 The PCH (Platform Controller Hub) provides the DisplayPort, USB, PCI Express, LPC, and SPI interfaces that connect to the peripherals on the PXIe-8820 RT. The DisplayPort block consists of 1 DisplayPort connector. The USB block consists of four Hi-Speed USB 2.0 connectors. The Ethernet Port block consists of an Intel® 82579LM Gigabit Network Connection. The Super I/O block connects to 1 serial port and 1 ECP/EPP parallel port. The SMB Front Panel Trigger provides a routable connection of the PXI triggers to/from the SMB on the front panel. The Watchdog block consists of a watchdog timer that can reset the controller or generate triggers. The PXI Express Connectors connect the PXIe-8820 RT to the PXI Express/CompactPCI Express backplane.